Except, this is not HGTV and I am not all dressed up, ready to be surprised with a perfectly designed, sparkling clean dream home. I'm in bed in day old sweats and drinking water to compensate for the food fest I threw for myself this weekend. I have to apologize in advance for all of the photos, I just can't stop. So, wanna see one half of our open concept floor plan? 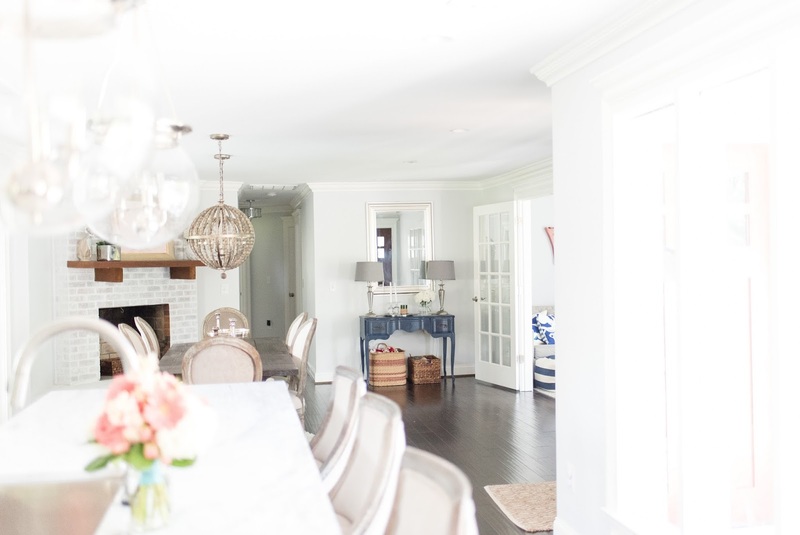 I've had a few questions about the natural light in our home and if it's a result of editing - none of the before photos are edited so you can see what we saw when we first walked through the door. I could never understand the pillars around the front door. When you walked in, you smacked right into them. take a gander at the interesting angle and the uh, custom shelving (?) to the left of the mantle. the space below is the only space in the entire house where we actually added walls. I wanted a play room for the baby and couldn't imagine what we would do with a formal living room (the intended purpose of the space with the windows). We decided to dry wall off the weird brick fireplace angle and rip out the fancy built in shelving. We actually kept the original mantle - after a good shot of pledge, she was too pretty to remove. I've been asked a ton about the fireplace color - it's kind of a funny story - the fireplace was a happy accident. We were going to paint the fireplace brick the same white as the trim and moldings (Ben Moore Chantilly Lace) but I happened to drop by just as the painters wrapped up priming the brick. I loved the white washed look and asked them to leave it, so the color is actually just two coats of primer! Our dining room table may be one of my most treasured possessions as Justin and our friend Mark built it. 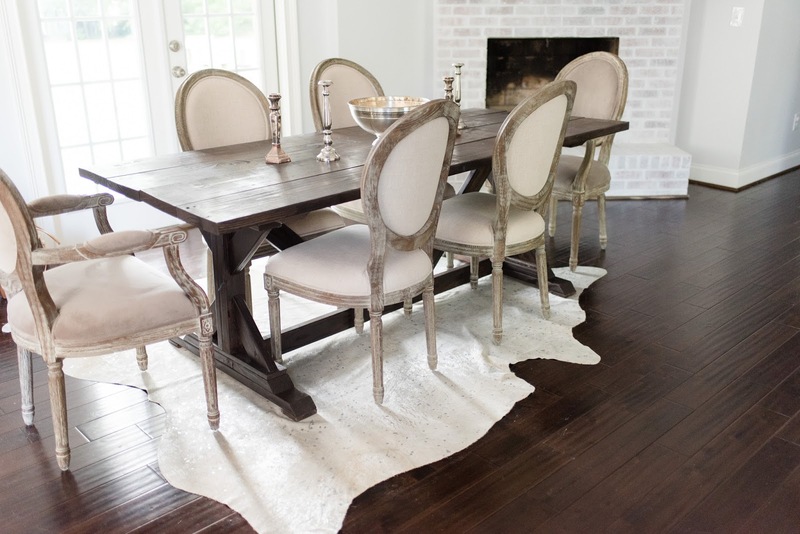 We designed this room specifically for this table and the rest of the style elements were chosen to break up the dark wood of the floor and the table. If you look closely, you can see that the fabric of the chairs is actually two different colors - the arm chairs are grey velvet and the middle seats are an oat colored cotton. We swapped out the old sliding door for a double french door to our back patio space and I love how much light shines in. I can't wait to show you guys the kitchen so that you can see the impact of these chandeliers with our (gigantic) kitchen pendants! 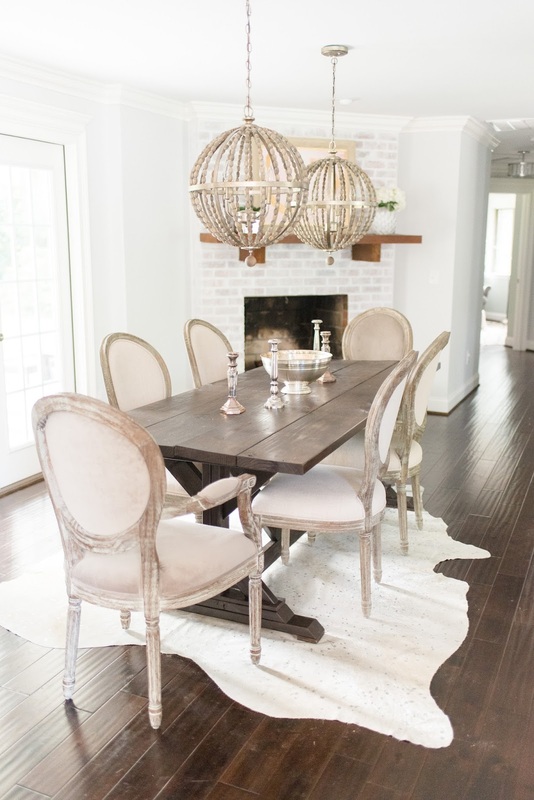 A metallic cow hide rug isn't for everyone, but the shape of this space was tricky thanks to the slanted brick hearth, so a regular old square rug just wouldn't cut it. I love how it highlights the dining space but leaves the rest of the area open for traffic. and a little glimpse of our kitchen lighting! I created an entry space using my mother's childhood vanity (gussied up with a healthy coat of spray paint) and baskets to catch dog toys and extra blankets and pillows. Mixing styles and price points with vintage pieces and heirlooms might be my most favorite way to decorate. Ok, so what do ya'll think? Most of this space was decorated using items that we've owned from our previous moves - I think just the lighting, dining room chairs and the DIY art over the fireplace are new (and previously we had not a single chair for our dining room....classy, class, class). Let me know if you have any questions about anything - and nope, we didn't use a designer or decorator! Wow, this looks amazing! You did a fantastic job. Did you do it yourselves or did you hire someone? I'm so impressed either way! Sooooo when I finally buy a fixer-upper, I can hire you to come style it for me, right? ;) But seriously, this is fantastic. It looks amazing! thank you! and after this one, I may be officially retired! I don't think we'll ever do this again for as long as we live! This is seriously amazing! Come decorate my house please! Yep...simply gorgeous. And I must say, keeping the original mantle was a fabulous decision. It looks so awesome! HOLY MOLY! can I come live with you?! It looks amazing (I have told you this already but I am putting it here too!) 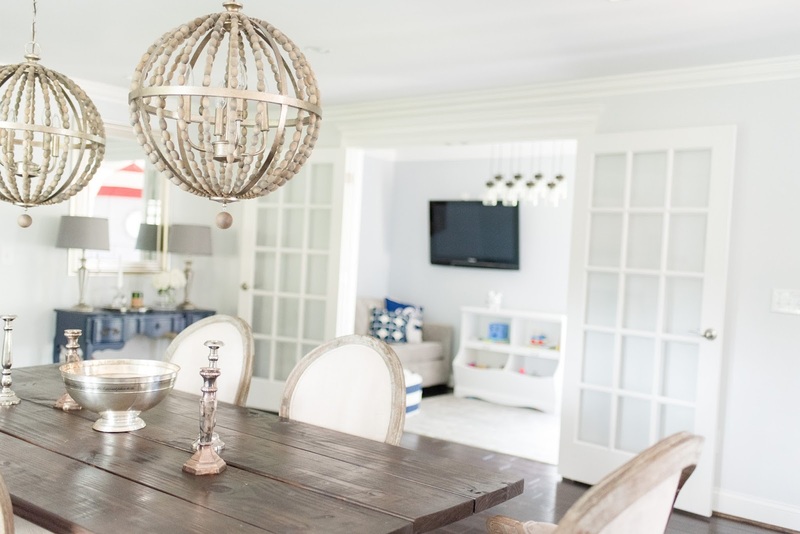 Those chandeliers though…LOVE! So gorgeous!!!! Like, seriously. I love everything! You need to go into professional interior designing. Or just come do my house. What a transformation! It's stunning! the before pics are crazy, right!? thanks so much! 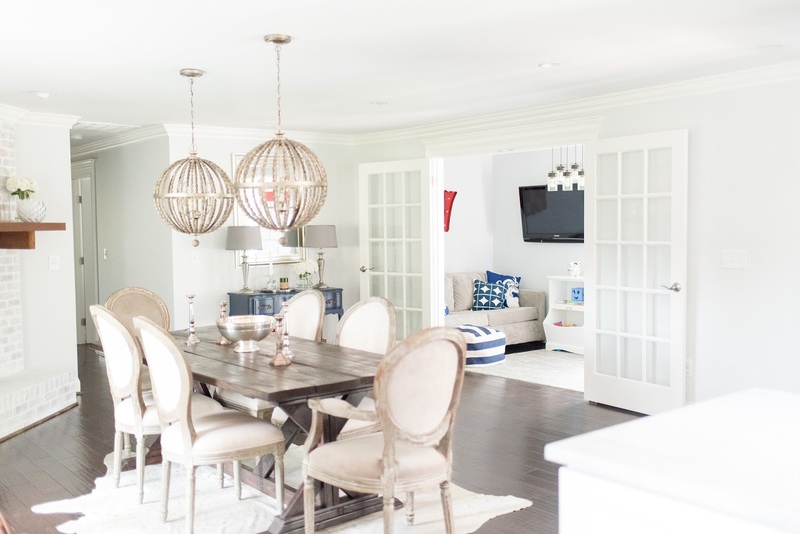 Hi, I just found your blog and love this renovation! I just bought a new house and am looking for paint colors, so when I saw this I scrolled down to see what color it was. I recognized the name immediately because my old house is mostly painted in Benjamin Moore's Sweet Innocence, which is the next darker color of that set! Absolutely stunning! Please come do mine!! ;) All the colors are perfection and I LOVE all the natural light. Dark wood/paint is THE. WORST. Our living room was painted a orangish red when we bought with only 3 windows...talk about dark! Excellent job. Can't wait to see more reno pictures. I love how bright it is! The lamps and rug are to die for! Absolutely gorgeous! Y'all did a great job! What flooring did you purchase? 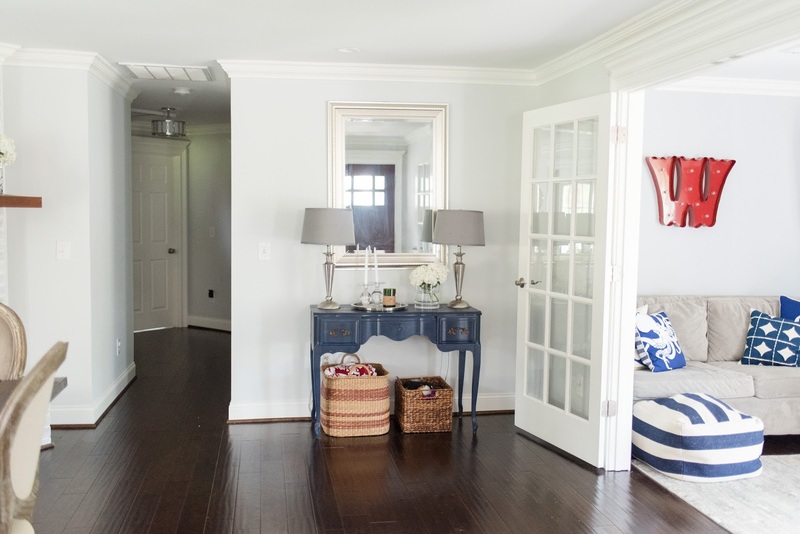 Love the color of your floors! Thank you! They are from Lumber Liquidators and are direct linked above - I'm on my phone or I'd link them here - they have a crazy long name! Simply beautiful. We especially love the paint color, Marilyn's dress. 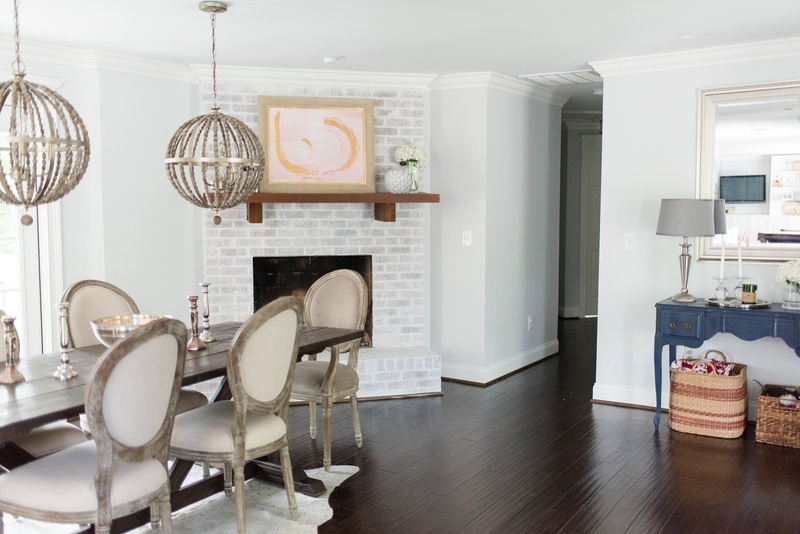 Did you lighten this paint to get the bright & airy effect? thank you !! Looking back on your reno pics, as I really love your space. Question, how have the dining chairs held up with your little guy? Any tricks on how to handle light upholstery with a toddler? Getting ready to purchase some new things and am a little nervous! :) Thanks!